The Seychelles airport closes at sunset (at least that's what the internet web site said); so an early departure is in order to complete the 12 hour flight during the daylight. 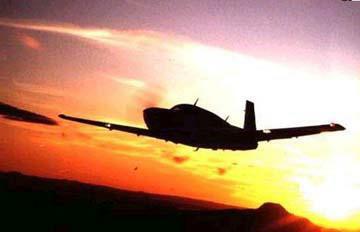 By starting the procedures at 4am, I hoped to be in the air at 6am. But what a frustrating morning it turned out to be. The airport was just opening at 4 am and there was no one at immigration, our first required stop. Some people were reading paperwork at the customs desk, so I wandered over there to talk with them. I'm not so sure that was a good idea. The man at the desk wanted to know all about the trip. He looked through each page of the passport, he looked through every paper in the departure folder, even though some were unnecessary. He asked a million questions about the whole trip. I was getting very irritated. After 30 minutes there was still no one at immigration. Each stop, immigration, security, airport manager, and ATC continued the same way; all interested in the trip and lots of unnecessary questions. I took to repeating that we had to be off by 6am. That just doesn't speed them up. I'll spare all the gory details, suffice to say, I was very frustrated at the end of it all, but only being 30 minutes behind schedule wasn't really all that bad. The takeoff was slow as usual. Trivandrum is on the south west coast, so we were over water immediately and climbing to 4000 ft. I wanted about 2 hours before climbing to 6000ft. The winds were better than forecast and we stayed above 130k on the first leg to the Maldives. There were a few buildups that we deviated around, but nothing major. At first I couldn't raise Chennai radio on HF, but finally they came through and confirmed position and future position estimates. There was one ominous looking black cloud ahead, but it was only rain. On the other side we were in the clear. 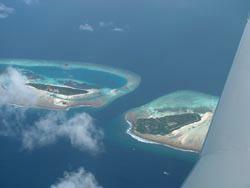 Two hours later and we were over the beautiful green, blue Maldive Islands. There are hundreds of them. Some inhabited, many not. It was a magnificent site. Male' center (Maldives Airport) was coordinating commercial flight arrivals without radar and was asking each plane for it's distance and altitude. We stayed at 6000 and out of everyone's way. One plane announced 356 passengers - that's a big jet going into the Maldives on vacation. Later on a second plane reported 337 passengers. What a tourist destination - and it's easy to see why. It looked beautiful from the air. Turn the corner at the Maldives VOR and we are headed 245 degrees. The headwind picks up and we're down to 123k. Sometimes up to 130k but mostly down. That's what we flight planned for, but I'd hoped for better. Oh well, 8 and a half hours to go. I had had a bad night's sleep and had caught a cold in the last 2 days in India, so I was sniffing, coughing and generally feeling poorly. Each time the ground speed picks up I feel a little better and when it's down I don't feel so good. This was not going to be one of my better flights. 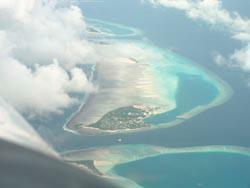 After a position report about 297 miles from Male', we were out of their airspace and Male' radio told us simply to "contact Seychelles" when we got within range. I thought that was weird at the time, but didn't think anything more of it. It was about 244 miles to the next position report. At that point, I tried Male', no contact, I tried Mumbai, no luck, I tried Chennai, they said we were weak and to try another frequency, but I couldn't raise them on that frequency. I could hear a few position reports from other pilots, but none clear enough to do a relay. I tried the HF email and that worked fine, so it wasn't our radio or transmission that was the problem. I wasn't comfortable with the situation because no one was answering and in the highly unlikely event of any problems, we couldn't immediately contact anyone. This was not a good place to be out of radio contact. 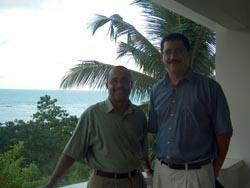 Phil, who had done my tanking in Lakeland Florida, had told me that out here over the Indian Ocean, no one even cared. So if we went down, no one would come looking. What a great thought; but now I'm here, I think he was right. I was probably safer over the Pacific than here over the Indian Ocean. Another 368 miles and I was over the next reporting position, but still no contact with Mumbai radio through any HF frequency. We were getting close to the extended range VHF of the Seychelles, so I tried calling them instead. Actually, the chart has a note saying that it is imperative to contact the Seychelles on HF 20 minutes prior to entering their airspace. I still couldn't reach anyone and thought: "Oh well, what am I supposed to do, circle around out here until I'm out of gas??" I kept on going right into their airspace, let them slap me on the wrist when I arrive. Finally I heard another pilot on VHF. I asked him to relay to Seychelles control for me which he did. No problem they said, just contact them when you are in range was the response. I felt better, they knew where we were and when we'd arrive. Only 180 miles to go. The winds had come around to easterly as forecast and speed was up to 140 k which was good, but I was actually feeling worse even though I'd eaten some food and had taken plenty of water. It's OK I thought, I can concentrate for one and a half more hours and get us onto the ground. I already had a bad headache - and all the time with HF static in my ears trying to do the contact reports had made it worse. Unfortunately I'd left the aspirin bottle in my luggage in the back, behind the tank. No way to get to it. Next time I'll remember to bring it up front with me. Finally I could hear Seychelles control and talked with them directly. They asked me to give them the times I had crossed the last two position reporting points - nice, I thought, just fill in the paperwork after the fact instead of being in communication with the pilots when they are over the ocean. I later learned that their HF had been out that day. The clouds were scattered and down to 2000 feet. I dropped through them and saw the island from 20 miles out. It looked similar to the Samoas, a lush island with a high ridge down the middle - beautiful. The 10,000 foot strip was a welcome sight as I turned downwind, base, and final then settled onto the runway. The weather was warm and humid, but when I opened the door, a cool breeze came in and it felt like heaven. I taxied to the parking location, stand 2, and saw two people, one wearing a mask, walking in our direction. The SARS Team. The masked lady asked if we needed a disinfectant spray can, but I told her we had already sprayed ourselves on departure and showed her our health declaration. She handed over the SARS declaration form which I filled out - indicating I had a cough from my head cold, but no fever. She took off her mask and said it was okay to de-plane. WHEW. I headed to the bathroom immediately. After 5 minutes outside and some cool water on my face I felt slightly better. Mike and Eddy arrived - Mike is a friend of and friend, Peter, in Houston, who had emailed, reserved a hotel, and offered to help us on arrival. They were both exceedingly helpful. The paperwork, customs and immigration were a breeze - only 10 minutes. What a difference compared with the two and a half hour Indian bureaucracy. 15 minutes later we were headed to the Guest House and in another 10 minutes we were listening to the sounds of the waves breaking on the beach, the birds chirping and were handed a glass of fruit juice. What a difference. I was in heaven. Paradise doesn't get much better than this. The surf on the beach, soft white sand, a breeze blowing through the open bar, comfortable chairs and a SayBrew beer - Life is GREAT. But I was very tired - and getting sicker; I think the last meal I had in India was getting to me. I was feeling worse as the day wore on and the following morning I was still not feeling good. Luckily, Dave took an Air Seychelles flight and joined me for a few days before continuing on to South Africa to join me there. We decided to go for a walk, thinking that I needed exercise. It was a beautiful walk over the other side of the island. Then we went to the airport to check the plane over and start figuring out the paperwork necessary to depart. After meeting with the Air Ops people, the Met office and the Avgas company, it looked like a bit of time at the airport on Friday afternoon would take care of all the details and payments and I could be off with very little trouble on Saturday morning. The Met Office was particularly good with satellite pictures, wind charts, everything I needed -- it's GREAT to have all the info available prior to departure. The next morning I went for a swim at our beach and had a lovely hot breakfast; but I was still not feeling up to par. I'd changed my plans to come to the Seychelles instead of Mauritius due to lack of avgas at Mauritius, but I hadn't done the detailed planning for the flight from Seychelles to South Africa, so that was my morning job. Once I reviewed the charts, I discovered it was going to be longer than I originally thought, 16 hours; but at least the winds will be favorable. If not, I can still land and gas up when I cross the coast at Mabuto. We took the bus to the main city of Victoria, to find a local internet cafe and get some emails off (it cost $7 per email from the hotel, so it's worth a trip). And, I'll look into the paperwork to get duty free avgas if possible. We were walking to the government building to check into Customs and Duty exclusions when I ran into our friend and helper, Eddy. He immediately took control of the situation, called around and told me where I needed to go. But, it was lunch time and the office would be closed, so he arranged for us to have lunch with his friend Gerard, who is from the Minister's office and is in charge of transportation, including the airport. I told him about the Seychelles website showing that the airport is closed at sunset -- he said that the facility is open 24 hours a day, but only staffed when a flight is expected. He said that he'd look into it. We had a wonderful lunch and talked about airports, yachts, travel and vacation destinations. 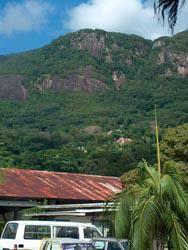 It's amazing how much everyone in the Seychelles makes it their business to take care of the tourists. Besides Mike, left, and Eddy, right, and now Gerard, many people ask how our stay is going, how we like the Seychelles; and they really seem to care about how we are treated on their island. And the bus drivers are very helpful -- it's easy to get around by public transportation. By mid afternoon I'm beginning to feel better - and it's good to feel like myself again. Now... back to the paperwork chase and seeing if I can get some duty-free avgas (at $3.80 per gallon every deduction helps ). That evening, after another swim, we sat on the chairs on the beach with a beer listening to the waves on the reef. The wind was blowing from the east and the air was perfect. It was like being in the Bahamas (but with mountains) -- peaceful, relaxing, wonderful. The mountains are granite, not volcanic. That means that they have always been there, and not under water, and give a magestic and breathtaking land and seascapes. The flora and fauna is different from volcanic islands and they have some plants that exist nowhere else in the world. There is a world heritage site as well as many nature reserves which total 46% of the land area. They are home to the world's largest populaton of giant tortoises and provide nesting grounds to great numbers of spectacular ocean going birds as well as to the last remaining flightless bird in the Indian Ocean. The Coco de Mer has the largest seeds in the world and take over 25 years to flower and reproduce. The Seychellois are hospitable peole who are a fusion of a number of cultures which has produced a multifaceted community. As they were both a French colony and a British colony, one finds both cultures in many parts of the lifestyle. There is Creole food, which is exceptional, as well as three languages, English, French and Creole. The Seychelles has long been at the forefront of environmental protection and started eco tourism in the 1970s before it became a buzz word. Spear fishing was banned, shell collection was restricted and plans for building hotels higher than the surrounding vegetation were disallowed. All this helps to preserve the Seychelles and it's tourist dollar, and keeps the waters clear, the beaches uncrowded and the hillsides verdant. It's truely a magnificent tourist destination. While in India, I was reading a Time Magazine dated May 12, 2003. There is an article on ALS and soccer/football teams. It was very similar to the BBC news show that I saw while in American Samoa. They have found an unusually high number of older professional football players who now have ALS. Doctors are now looking into any possible link with drugs or painkillers and ALS. The month of May is ALS awareness month in the US and I hope other articles and news programs were published and broadcast to help increase the awareness and hopefully contributions to find a cause and cure. Also while in India, I received an email from Jackie in Australia. Unfortunately she didn't find out about my web site until after I'd left; I would like to have met her. This 40 year old woman who has ALS for 15 years and is completely in the care of others 24 hours a day, wrote me a long email about herself and ALS awareness in Australia, which was early April. She's on a respirator and need others to do everything for her. Once her hand is placed on the trackball, she can type an email and look at web sites, painfully slowly. Her doctor's had given her 18 months to live 15 years ago. She believes that God has something else for her to do, and I'm sure he does. I very much appreciate her email and her support as I continue on this journey and I wish Jackie and her family all the best. I'm happy to hear from you, please email me at cagarratt@gmail.com any ideas, suggestions or flight tips. Thanks.